Perfect Fit For Those With Extra Wide Calves. High Quality Light Breathable Fabric Allows You To Stay Dry And Comfortable Throughout The Day. Great For People Standing On Their Feet All Day, Perfect For Nurses, Runners, Teachers, Maternity, Cycling, Walking, Crossfit, Workout, Hiking, Flight Travel, And Ect. 20-30 mmHg Graded Compression To Relief Stress Buildup Throughout The Day. Helps Rejuvenate Tired Legs As It Enhances Quicker Recovery. 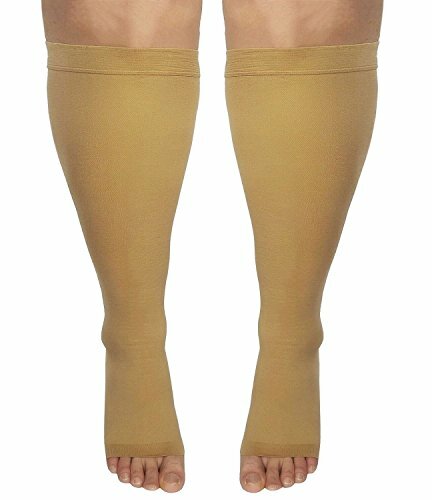 Provide Mild Squeezing For Warmness And Enhance Blood Moving Through Your Legs. Helps With Anti-Fatigue Relief During Long Day Of Work or Long Hours of Flight, Helps Energize Your Leg Throughout The Day. Relief From Varicose Vein, Swelling, Edema, Lymphedema, Venous Insufficiency, And Superficial Thrombophlebitis. Ease Muscle Soreness As Well As Leg Fatigue. Perfect For Everyday Activity - Great For People Standing On Their Feet All Day, Perfect For Nurses, Runners, Teachers, Maternity, Cycling, Walking, Crossfit, Workout, Hiking, Flight Travel, And Ect. If you have any questions about this product by Runee, contact us by completing and submitting the form below. If you are looking for a specif part number, please include it with your message.